Tracking Santa Tradition Is Serious Fun For NORAD : The Two-Way The longstanding tradition has reportedly become the biggest single public outreach program for the Defense Department, according to Politico. More than 100 thousand kids reach out each Christmas Eve. The site, which follows a graphic of Santa on his sleigh across the globe, complete with a "gifts delivered" tally, receives visitors from more than 200 countries and territories, according to NORAD. Live updates on his whereabouts are provided in seven languages. The Colorado Springs Gazette reports the site had more than 60 million visits last year. "The numbers keep on growing," Canadian Navy Lt. Marco Chouinard told the newspaper. Outside its Christmas duties, NORAD — jointly staffed by the Canadian and American militaries — is tasked with detecting aerospace threats to protect North America from air attacks. And the group says it relies on its resources to keep up with Santa's fleet flock of reindeer, "through satellite systems, high-powered radars and jet fighters." The heartwarming and oft-reported tale of just how NORAD's Santa operation came to be begins in 1955 with a typo in a Colorado Springs newspaper. "Hey, Kiddies!" the Sears advertisement read over an image of Santa. "Call me on my private phone and I will talk to you personally any time day or night, or come in and visit me at Sears Toyland." Signed, Santa Claus. Except Sears misprinted the phone number and accidentally gave out Col. Harry Shoup's secret hotline at the Continental Air Defense Command, today known as NORAD. In 2014, Shoup's children talked to StoryCorps about what happened next. After Shoup answered the phone, his daughter, Pam Farrell, recalled, "There was a small voice that just asked, 'Is this Santa Claus?' "
Farrell's sister, Terri Van Keuren, says her dad thought it had to be a prank. And amid Cold War tensions and fears of potential nuclear disaster, Shoup wasn't happy about it. "And Dad realized that it wasn't a joke," Van Keuren says. "So he talked to him, ho-ho-ho'd and asked if he had been a good boy and, 'May I talk to your mother?' And the mother got on and said, 'You haven't seen the paper yet? There's a phone number to call Santa. It's in the Sears ad.' Dad looked it up, and there it was, his red phone number. 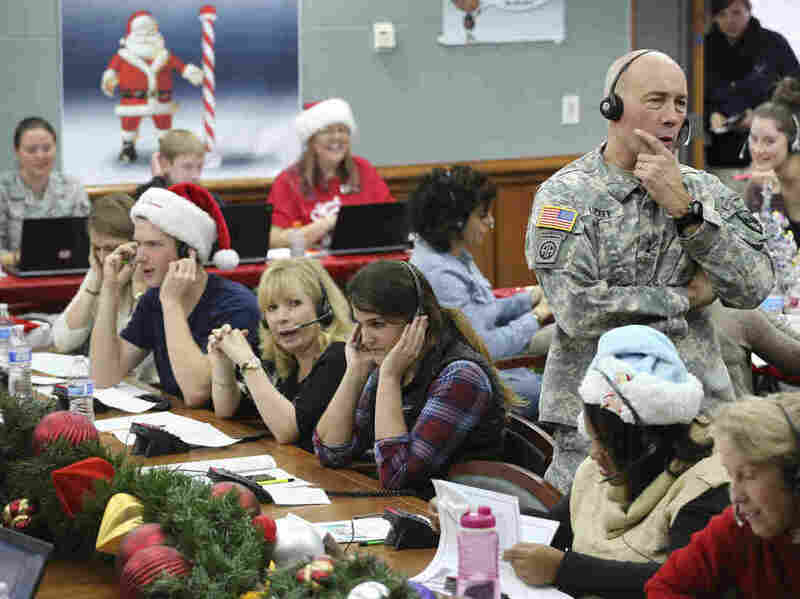 And they had children calling one after another, so he put a couple of airmen on the phones to act like Santa Claus." But it's fun that NORAD takes seriously, having become the Defense Department's biggest single public outreach program, according to Politico. NORAD provides a 14-page internal handbook outlining the operation, including such Santa statistics as when he completed his first flight (believed to be Dec. 24, 343 A.D.) and providing talking points for the question that can leave parents squirming: "Is Santa Claus real?" "Historical data and more than 60 years of NORAD tracking information lead us to believe Santa Claus is alive and well in the hearts of people throughout the world," the handbook advises. "As soon as you're hanging up there's another kid wanting to talk to you," Preston Schlachter, NORAD's Track Santa program manager and its director of community outreach told Politico. "One of the coolest things I like about the program is the multi-generational aspect of it. We are seeing feedback on social media, people who call in and tell us they tracked Santa when they were kids and they've introduced it to their kids and now they're introducing it to their grandkids." NORAD Tracks Santa's Facebook page shows what is happening live inside the operations center and has nearly two million likes, while its Twitter account has more than 150 thousand followers.